How can I change where my attachments are saved by default? Attachments are saved in your Documents folder by default. You can't change the default location but can specify a different location each time you save an attachment. Choose the drop-down arrow to the right of the attachment icon to open the attachment menu. Choose Save As to save to your computer or cloud storage location. How do I save an edited attachment so my changes are attached to the original email? If the attachment sender used OneDrive or another cloud storage option, any changes you make to the attachment are automatically saved. 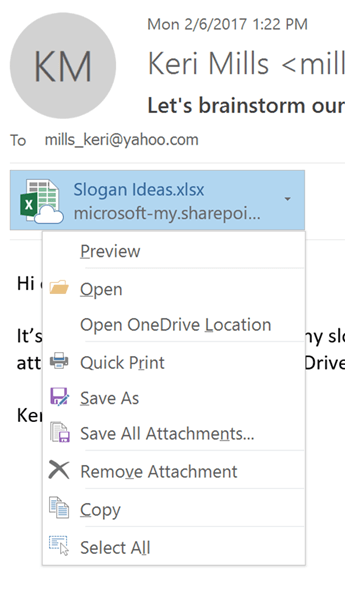 If the sender didn't use a cloud storage option, use the drop-down arrow to the right of the attachment and choose Save to OneDrive. Can I turn off attachment preview?Yes. You turn file preview on or off in the Trust Center. In Outlook, select File > Options > Trust Center > Trust Center Settings >Attachment Handling > Turn off Attachment Preview. How do I open or preview PDF attachments? If you use Microsoft Edge as your default browser, PDF attachments should open in Edge. To open them in Adobe Acrobat Reader or another PDF viewer, see Change the file association for an attachment. How do I change the browser used when opening or previewing attachments? Outlook will use your default browser to open or preview many types of attachments. To change your default browser, see Change your default browser in Windows 10.